continues to introduce pedagogical innovations, which motivate students not only to learn, but also engage with biology. This bestselling textbook is designed to help students stay focused with its hallmark modular organization around central concepts and engages students in connections between concepts and the world outside of the classroom with Scientific Thinking, Evolution Connection and Connection essays in every chapter. The 9th Edition offers students a framework organized around fundamental biological themes and encourages them to analyze visual representations of data with new Visualizing the Data figures. A reorganized Chapter One emphasizes the process of science and scientific reasoning, and robust instructor resources and multimedia allow students to engage with biological concepts in a memorable way. Unparalleled resources let instructors develop active and high interest lectures with ease. Mastering Biology is an online homework, tutorial, and assessment product designed to improve results by helping students quickly master concepts. Students benefit from self-paced activities that feature personalized wrong-answer feedback to emulate the office-hour experience and help keep students on track. 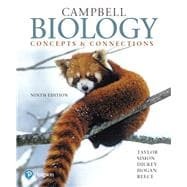 With a wide range of interactive, engaging, and assignable activities, many of them created by the Campbell Biology: Concepts and Connections authors, students are encouraged to actively learn and retain tough course concepts. New Mastering Biology activities for this edition include “Key Topic Overview” videos that help students efficiently review key topics outside of class, “Evaluating Science in the Media” activities that help students to build science literacy skills, and more “Visualizing the Concept” animated videos help students further visualize and understand complex biological processes.